Like your nachos with the works? This recipe will work for you! It's got it all: ground beef, taco seasonings, yummy melted cheese and chopped tomatoes. Cook meat with seasoning mix as directed on package. Stir in beans. 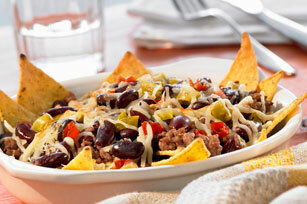 Arrange chips on large ovenproof platter; top with meat mixture and cheese. Bake 3 min. or until cheese is melted. Top with tomatoes. Prepare using Cracker Barrel Shredded Creamy Mexicana Cheese.